If you believe a child is the victim of abuse, check your suspicions against these compiled lists of common indicators. One or more of these indicators should prompt a closer look at the child and the child’s environment. 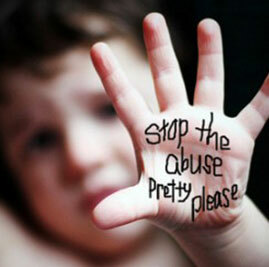 It is important to remember that many of the indicators may be observed in children where abuse is not occurring. However, a history of suspicious injuries, patterns of behavior, and verbal reports of abuse are all key elements in recognizing possible abuse or neglect. • Bruises in various stages of healing. • Unexplained burns: cigar, cigarette burns (especially on soles of feet, palms, back, or buttocks). • Immersion burns (sock-like, glove-like burns on buttocks or genitalia).